Visa-freedom for residents in Norwegian-Russian border areas compensates for the general sharp drop in border-crossings from Russia’s northwestern regions. “There were 240,829 border crossings in 2015,” says Gøran Stenseth, Police Officer at Storskog, Norway’s only land border checkpoint to Russia. That is down 19,5 percent compared with 2014 when close to 300,000 border crossings were counted. The decline would have been way more dramatic wasn’t it for the increasing number of people crossing the border with so-called local border permit, an ID that allows citizens living less than 30 kilometres from the border to cross without holding a visa. According to Stenseth, 41,649 of the border crossings were done by Norwegians under the visa-free arrangement, while 18,972 (until November 30th) border crossings took place by Russians traveling with border zone ID-cards. It is citizens of Kirkenes, Nikel and Zapolyarny that travel without visa. Finnish Lapland saw a significant drop in border-crossings last year. 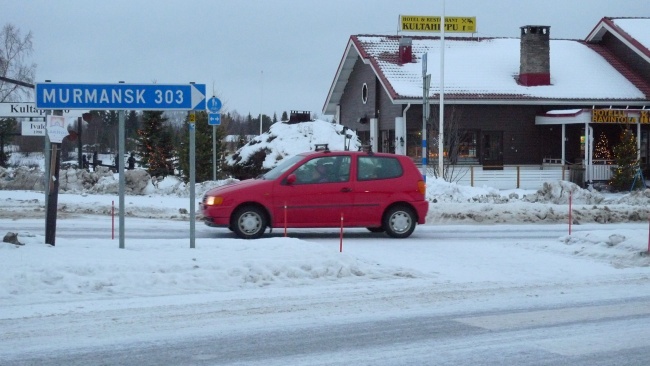 At Raja-Jooseppi, Finland’s northernmost border checkpoint to Russia, year-on-year traffic declined by 32 percent. At Salla checkpoint, on the main road between Murmansk and Rovaniemi, traffic dropped 27 percent in 2015, Finland’s Board Guard Service reports. 156,367 border crossings were counted at Salla, while 76,859 border crossings took place at Raja-Jooseppi. In total, there were 233,266 border crossings between the Kola Peninsula and Lapland last year, some 7,500 less than at the Russian-Norwegian border. A sliding Russian ruble is the main reason for the sharp decline in border traffic after a steady increase year-by-year since 2009. Much of the border traffic from Russia to Norway is people on one-day shopping tourism to Kirkenes. Shopping and tourism traffic to Finland is more vulnerable than to Norway, since distances are longer and involves a night or two at a hotel. Also; the euro is stronger than the Norwegian krone.